I have an Atari 800xl (have the original 1050 drive and 410 Program Recorder <- repaired it and it works again) Anyhow, I'd like a drive emulator. Since there are a few different drive emulators for Atari 8bit. Today, 2019, what would you folks recommend? I was leaning towards an S-Drive MAX because of the screen. But I'd value your opinion. Additionally, I live in the USA where we have 60Hz voltage. Is that a problem since most of these drives are coming from Europe where they have 50Hz voltages? Whether you prefer SIO2SD or SDriveMax also depends on whether you prefer buttons (SIO2SD) or a touchscreen (SDriveMax). Be aware that the touchscreen is not the type found on your typical smartphone, more of a "push screen"like on a Palm and easier to use with a stylus than with your fingers. SDriveMax is easier to build yourself as it requires minimal soldering, especially if you use Chinese clone parts and use it as the only device on the SIO bus, obviating the need for the extra chip and resistors. SIO2SD is a bit cheaper to buy, especially if you take the "bare" version and make a case yourself. The larger screen on SDriveMax certainly makes operation a bit more intuitive than the "forward/back/shift" concept of SIO2SD. Mains voltage is not a concern as both are powered from the SIO bus and even if you decide to run SDriveMax from a USB PSU those are generic and available everywhere. I thought I read somewhere that the Max requires a USB power supply and can not run properly using SIO power. Can someone confirm? Have never had a problem running mine on SIO power. Well, there are two main stand-alone devices and they have already been mentioned; the SIO2SD and the S-Drive Max. I personally prefer the SIO2SD, but they are both excellent devices and you really can't go wrong with either. If you have a PC close, there's also the SIO2PC-USB that you can use to connect your 800XL to your PC and access disk image files stored there, basically turning your PC into a giant drive emulator. Any of the three would fulfill your basic needs of Atari disk drive emulation. You just need to look at all the other available features of each, as well as the pros and cons of each, and decide which is right for you. Personally, I started with an AtariMax SIO2PC-USB, then picked up an Ultimate Cart SD multi cart. My next purchase will likely be one of Lotharek's excellent SIO2SD devices. Quite happy here with the USB PC idea, not had problems with it but obviously it needs a supported PC type platform for the loader..
For stand alone I'd probably think about the MAX but in terms of keeping it a little cheaper and not bothered about super fancy screens the the SD would be fine...In terms of drive emulation I believe they are all very good..
And here are a couple of pics of my setups. 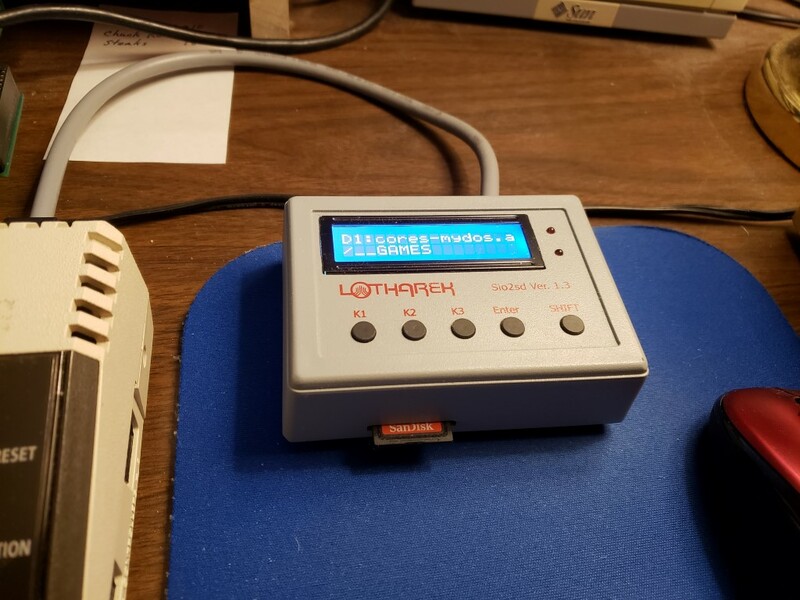 Of the SIO2SD devices, I think that Lotharek has the nicest. Note the open folder of ATR images -- mouse click easy access to hundreds of images. How did you get the video output of your 800 XL to appear on your Windows machine? It looks like he's probably feeding it in through an ATI Wonder TV card, or something along those lines. Yes, ATI All-in-Wonder graphics & capture card. This is the best system I've found for using the Atari and PC. But newer versions were aimed primarily as TV display and used a video buffer that destroyed the usefulness with computer/gaming systems. The most "power" and versatility comes from the PC based ones such as APE and Respeqt but the downside is you have a whopping great PC or laptop tethered to your Atari. My standalone choice is SIO2SD but I'd not mind a SIO2BT type solution if it could be used with a small phone. One of the highest criteria for me re the standalone devices is that you have to be easily able to change disk image without needing to involve the Atari in the process, otherwise multi disk games could be unusable. All these devices though take a back seat thanks to the likes of IDE +2 and SIDE* - but they still have the advantage of usually being easier to get files and images across from a PC. I keep seeing mention of the Side2 cartridge. Help me to understand what it offers that make it so great. I see mention of hard drive access, but I have no interest in running a hard drive with my 8-bit. That being the case, is there any other reason that it might interest me. I just want to better understand what it is and what it does. Advantage of the IDE class devices is speed - typically SIO devices will do a little over 1K/second standard speed and 4 or 5 times that in turbo speeds. IDE types generally do 30K or better. 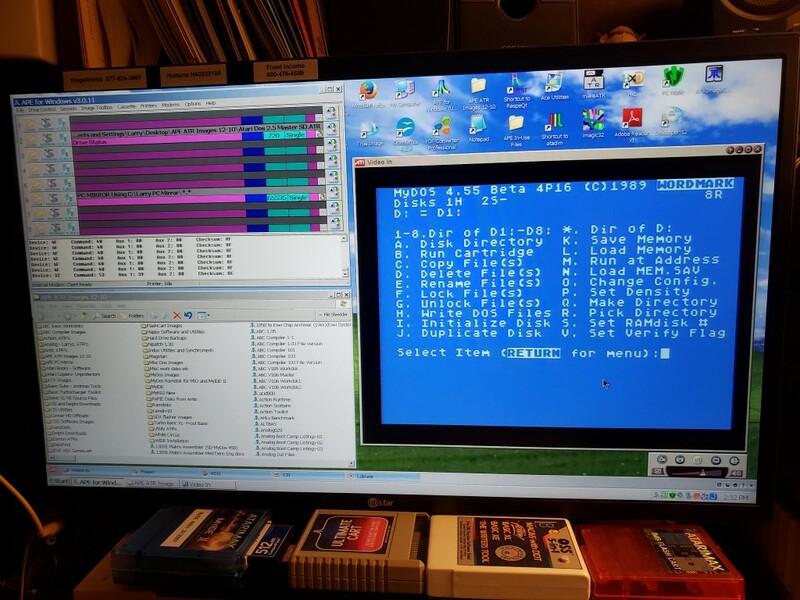 If you have a SID2 cart *and* an Ultimate 1MB board in your Atari, Flashjazzcat's BIOS lets you access ATR disk image files stored on a FAT partition of the CF card in the SIDE2 cartridge. You can mount multiple disk images in each of several disk drive slots (D1:, D2: ...) and then cycle them by pressing the external button on the SIDE2 cart. So, for instance, you can mount a two-disk game in two slots, and when the game tells you to insert the second disk, for instance, you can tap the button to swap the two disk images and the game now has access to that second disk image, now rotated to the D1: slot. Since this functionality also lets you write to ATRs stored on the FAT partition, you can do the same trick with single-disk games that use a second disk to save your progress. Put the game disk in D1:, your save disk in D2:, then swap in your save disk with a tap of the button, and then a second tap will rotate the disks again, putting the original back into the D1: slot ... You can rotate as many disks as you have mounted, though admittedly it can be tricky if you have more than two or three. It's all very easy to use and elegant, and makes the U1MB/SIDE2 combo a must-have for me as a modern hobbyist using my classic Atari hardware. My "daily driver" Atari for 2 years was an 800XL with U1MB + SIDE2 cart, then I installed another U1MB in a 1200XL I restored to working condition; that machine was my daily driver for another 18 months or so until I built my 1088XEL. OK, thanks for explaining that to me. Now I think I understand a little better. While I am slowly gaining interest in the Ultimate 1Mb Upgrade, I really don't think I'd be interested in the Side2 Cartridge. While neat, I already have other devices that perform the same functions. I'd love to have a 1088XEL as well, but I can't afford to spend $500 to $600 (or more) on one when I already have an 800XL that, with the upgrades, I have and have planned, will do all I need it to. They are definitely cool though. I use my SIO2SD more than any of the other SD card devices that I own. However, if I were purchasing one today, I would be inclined to buy Lotharek's new (and somewhat crudely named) SIO2SD variant. It has a larger display than the original SIO2SD model and I really like the look of its clear casing. While this „PCB sandwiched between two pieces of plexiglass“ is quite popular now and easy to build, it leaves you with a dust catcher that is hard to clean. The new display is larger but as in larger letters, not more characters on screen. My son uses a SIO2SD which sometimes stays on for months, so durable it is. I did forget SIO2BT in my prior post, that‘s quite elegant, too, as it allows to use any old Android phone or tablet to host the files. Actually, no, it says the new display is 2x20, as opposed to the 2x16 of the current model, so it is 4 characters wider than the original. I think I'm going to go throw some money at Lotharek! Edited by bfollowell, Tue Mar 19, 2019 8:25 PM. I thing the Sio device that end up using the most is a laptop with RespeQt and sio2pc. The reason is that most of the time I am trying something interesting I found here in the forum, a new app a new variation of a game, the new Plato, svg rendered, etc. So I need to start my PC anyways to update the files in the SD Card. So now I just connect the cable to the laptop and everything is easier and faster. Don't get me wrong, sio2sd is a great amazing device, but in my case, having a laptop beside the Atari setup, makes the use of a PC much more convenient, and RespeQt is an amazing piece of software, you can swap disk, view the disk content, extract and add individual files, create new disk, load cassette images, and much more, with the convenience of a mouse and big screen. Edited by manterola, Tue Mar 19, 2019 8:51 PM. is connected to the 130XE, VGA input connected to the Pi, all I have to do is switch inputs when I want to change a disk. Saves having 2 screens and a tiny Pi. Have a picture of your setup? The Pi sounds like an interesting option. The Arduino doesn't need much current. the chain - no worries at all. However, there is another aspect. switch off the SDrive-Max too. to spend the device its own PSU. I would prefer Lothareks Sio2Sd too. It proofs it's relia/durability since years. Whatever your choice may be, it can't be wrong. Just do yourself the favor and plug it in or use the battery option don't bother with sio power. Yes it does tape emulation. the device has really shaped up.